The GENEROUS, AL-KAREEM, is He Who forgives the sinners even though He is capable of punishing them, on promising He never breaks His Promises; He Listens and responds to the call of the supplicant when he calls on Him. Allah never fails anyone who resorts to Him and hopes never supersede His Power; He grants without being supplicated. He cares not how lavishly He gives nor to whom He grants; He forbids that anyoneis resorted to or called on save Him. Al-Akram, which means the Most Generous or the Most Bountiful, is the superlative adjective of AL-KAREEM, which means the Generous. Allah, Praise and Glory be to Him, says, “Proclaim! and thy Lord is the Most Bountiful.” (‘ALAQ, 3); He is the Lord of donation and generosity; He honours His created beings with His overflowing Favours, and grants His chosen people with His flooding Blessings. 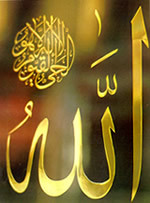 Allah, Glory be to Him, mentioned in the Qur’an what one of the believers said, “Ah me! Would that my people knew what Iknow. For that my Lord has granted me forgiveness and has enrolled me amongthose held in honour.” (YA-SIN, 26, 27).Anyone who is deprived of Allah’s honour will never be honoured byanyone, “..and such as God shall disgrace, none can raise to honour.” (HAJJ, 18). He is, and will eternally remain to be, the Generous. He says, “All that is on earth will perish. But will abide for ever the Face of thy Lord.” (RAHMAN, 26, 27). Glory be to the GENEROUS, He is Allah.